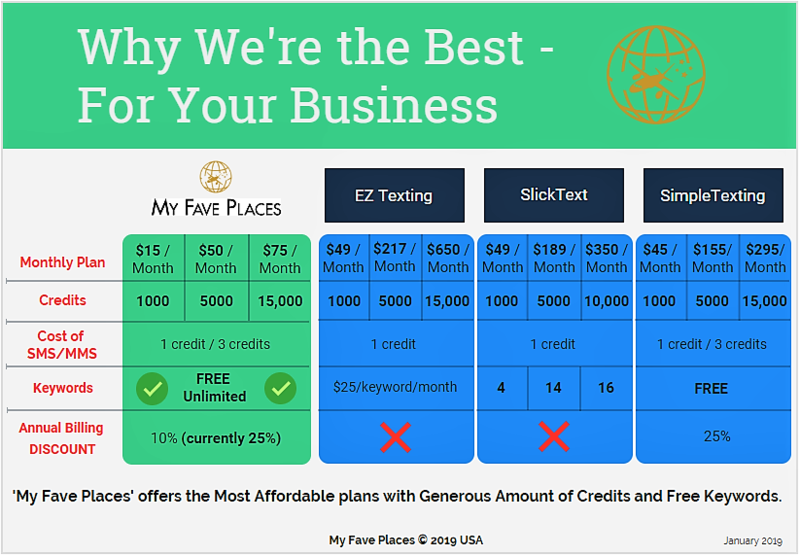 Are you the most affordable SMS Marketing provider? We think we are. Through our ‘Powered by MFP’ account we give you access to the core text features of a SMS marketing platform which is what a small business needs - with a generous credit and generous keyword count - all at a much lower price than opening accounts directly with any other SMS vendor. Plus we are the only ones to send you a free in-store poster to kickstart getting SMS subscribers. Plus if you need special campaigns or a tool such code for an online form to place it on your website to sign up users, we may be able to help set up - at no extra cost. Just ask us! For more specialized customization or large-scale volume, we recommend you open an account directly with our partner SimpleTexting.com. Who provides the SMS Platform? We’ve partnered with SimpleTexting to use their robust platform. A recognized, reliable industry leader, they also have great educational resources and everything you need to set up and create great campaigns and offers your customers will love. I’m busy and I don’t have time to sit at my computer and create campaigns or check results. No problem. There’s a free mobile app from SimpleTexting, which has all the same features as the desktop (inbox, campaigns, autoresponders, keywords, your subscribers and help). Don’t forget, we se up the account for you, so all you have to do is download their new mobile app and see just how easy it is to harness the power of text marketing. Available: Google Play and Apple App. You can create, send and monitor a campaign within minutes from you mobile phone. What are credits and how many credits do I need? Outgoing SMS messages are referred to as ‘credits’ and one SMS message = 1 credit. So, for example, to send 1 SMS message to 500 subscribers 4 times a month, you would need 2,000 credits for that month. MMS messages are 3 credits each, so you would need 6,000 credits for the same volume and frequency. Please note, incoming SMS messages (i.e. responses from your customers) are free. Our service is currently only available in the U.S. If you are interested in Canada, please contact us here. No. While we do have terms and conditions and compliance policies that must be followed, you do not have contracts or set up fees. You can cancel any time. Is there a dashboard and place I can see my customers who've sign up? Yes, there is a web and mobile dashboard - hosted on SimpleTexting.com. You can see your subscribed (and unsubscribed) SMS customers, create campaigns and track your progress on a simple dashboard. Please note connecting your accounts to the Facebook & Twitter accounts within the SimpleTexting platform is not supported as the service is shared. We recommend request that posts be done manually directly on your Facebook & Twitter channels, in the same way you do today. Are my customer lists private? Yes. Only authorized users from your company, My Fave Places (who manages the account) and SimpleTexting (who manage the platform and to provide tech support) can see the list of customer names (subscribed & unsubscribed). You will control and are responsible for the messages that are sent to customers. Who is responsible for creating SMS Marketing campaigns, reviewing customer responses and managing customer lists? You are. My Fave Places and SimpleTexting will get you set up, provide guidance, informational resources and messaging rules that must be complied with. However, for ongoing day to day creating text campaigns, wording, reviewing customer responses and customer lists, these are your customers and you are the one best placed to create offers and to connect/respond in a meaningful way. We can help with more sophisticated campaigns. Just ask! Pro tip: Do watch your subscriber numbers and watch the numbers of people subscribing & unsubscribing from your list. Are there restrictions on the types of businesses I promote or messages I can send? Yes. There are strict restrictions on certain types of messages and product promotions that can be sent. We insist on doing SMS marketing the right way. In addition to respecting CTIA requirements, we also keep up with carrier standards. For that reason, we don't allow pornographic, drug related, alcohol themed, or hateful language on our platform. Your message content is subject to SimpleTexting’s approval. Violating these will cause the messages to be automatically blocked from sending and potentially the account may have to be closed. Read more in detail here. Also, My Fave Places and SimpleTexting do not support spamming, phishing or malicious practices, and accounts that breach these will be closed. Yes, you can upgrade or downgrade at any time. Just contact us here. If you are going over your limit, we’ll notify you. SMS is limited to 160 characters in the U.S. MMS allows up to 1,600 characters. We sure do—save 25% for a limited time when you pay for a year up front. Our regular annual discount is 10%. How do I build my list of SMS customers? There are lots of ways to build a list. In-store poster. Take advantage of our free customized poster that we print and send to MFP SMS customers. No charge! what kind of message will work best for your audience? Will it be a coupon, an event notification, or a reminder? engaging your customers to sign up with an instant offer they can redeem, such as a free drink or discount if they sign immediately. You'll pretty soon you'll have a big, opted-in list. Print your own in-store signs. Put up a web form on your site to get customers to subscribe (we can give you the code - see below). Print an offer/coupon on customer sales receipts (see below) then advertise it with the 555888 short code. If you already have a customer list already with mobile numbers, upload these into the SimpleTexting platform (we can help you). You can send your first campaign in minutes. SimpleTexting has more ideas here. How many texts should I be sending? Every business is different, but we recommend one - two text messages a week. There is a automated compliance message that alerts customers to expect up to 8 messages. How do you count messages? Each text message is equal to one message credit to one phone number. In other words, if you have 250 subscribers on one of your keyword lists and you send a message to that list 2 times, you've used 500 message credits. MMS messages are 3 message credits each. In your plan, you can use a mix of text and MMS messages. Note, incoming messages are free. SimpleTexting can only support businesses that utilize major US (and Canadian) mobile carriers. At present we only support US, however if you are Canadian business wishing to apply, please fill out the form, noting your Canadian address. MFP is unable to change your password for you, but after going to your Customer Account link, you can click Forgot password? to send yourself a password reset email. This link expires after 24 hours. Unfortunately, it isn't possible to change the email address associated with your account at this time. You can create a new account using your updated email address. Can I cancel my SMS with MFP subscription? Yes. If you wish to cancel future renewals, you cancel your subscription from your Customer Account on My Fave Places site. We will then cancel your account within SimpleTexting.com. We’ll even refund remaining balance as long as there has been no breaches of Compliance, SMS Usage Policy or SMS Terms & Conditions.